Southern Methodist Mustangs forward Ben Moore (00) thanks his teammate for a pass against Tulsa Golden Hurricane during the first half at Moody Coliseum in Dallas on March 2, 2017. 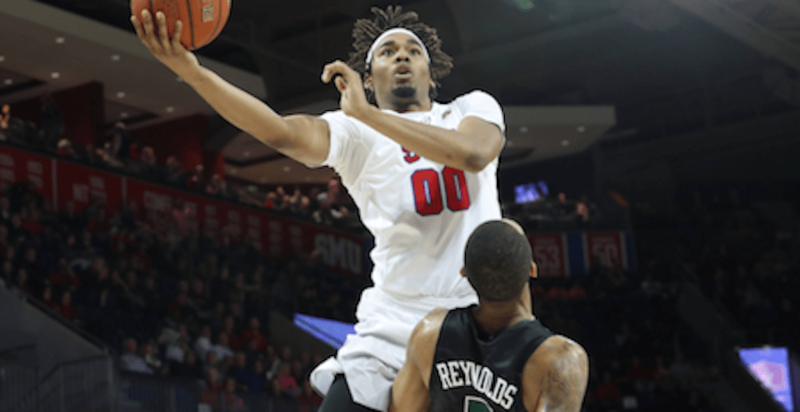 The Indiana Pacers will be using their final two-way contract on former SMU forward Ben Moore, according to Sports Illustrated's Jeremy Woo. He's had some good moments in Fort Wayne this year while averaging 11 points and 6.6 rebounds in 28 minutes. Despite coming off the bench every game for Fort Wayne, Moore is averaging 10.9 points, 6.6 rebounds and 1.7 assists in 28.1 minutes per contest this season. Edmond Sumner, the Pacer rookie out of Xavier, was the organization's other two-way contract player. Moore was signed to the Pacers once this past August to play with Indiana's summer-league team. This has no impact in fantasy circles, as Moore will likely spend most of the season in the G-League. Could David Fizdale replace Luke Walton as Lakers head coach?